At 272 words, the Rangers statement of Thursday night was brief compared to some of their bloated efforts of the past, but it will still go down as an extraordinary thing that somehow managed to make an already bad situation even worse. 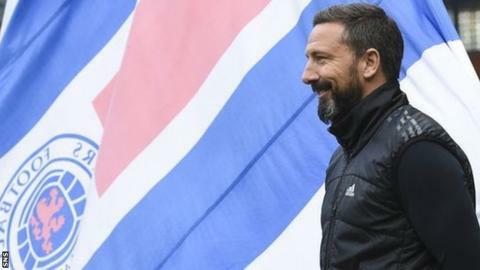 In explaining why they failed to secure Derek McInnes as their new manager - part of the statement was a thinly-veiled attempt to portray him as being too weak to take on the job - the Ibrox board resorted to "patronising", "spiteful" and "undignified" language that was "unbecoming of Rangers". Those are not the remarks of a pundit, or a journalist, or a fan from another club, they are plucked from a Rangers heartland, from the Bearpit, the comments section of the most thunderous of all Rangers supporters' forums, Follow Follow. The statement was described as "a shambles", "disrespectful", "awful", "unnecessary", "condescending drivel", "embarrassing and childish" and "absolute garbage." The board, by turns, were depicted as "not fit for purpose", "lacking in class", "farcical" and "massively failing the support". One contributor said: "Amazingly, there seems to be no end to our uselessness." Others called for the board to be sacked. In among the outrage, there was, of course, a championing of those in power at Ibrox and backing for every word contained in their statement, but the majority appeared mortified by it. Time and again, the same sentiment arose: 'This kind of stuff should be beneath us'. Some Rangers fans would appear to be arriving - if they have not already arrived - at the point where the goodwill is going, or has gone, where the gratitude of a section of the fans towards chairman Dave King and his team for ousting the old guard has become exhausted. There comes a time when being better than the Easdale brothers is not enough anymore. The tortured Mark Warburton saga, followed by the expensive catastrophe of Pedro Caixinha, followed by the protracted and failed pursuit of McInnes, has caused significant reputational damage to this Rangers board. This is not outsiders talking. It's their own people. There was no need for such a soap opera. When Caixinha was sacked, McInnes was immediately identified by Rangers as their number one target. They looked around to see who else was there, as they're obliged to do in the interests of the club. They returned to McInnes. Thought about it again. And thought about it some more. All of that soul-searching, in the wake of their blunder with Caixinha, was understandable, but it should have been over weeks ago. Rangers' loss to Hamilton at Ibrox on 18 November really ought to have been the trigger for action. They'd had more than enough time to get their ducks in a row by then. In turning down Rangers' approach, he has also made it harder for them to secure a manager with the kind of track record they require. McInnes had become fed-up with the disruption the episode was causing in his professional life. Through their prevarication, Rangers planted seeds of doubts in his mind. How much did Rangers really want him? Were they as one in their support of him? He always had issues with the Rangers job, although most people thought he'd overcome them. Even from a distance, he could see things that troubled him, not just questions about budgets, but issues with certain people of influence at the club. McInnes has a huge amount of control at Pittodrie. He has people all moving in the same direction, all with the same goal of bettering Aberdeen as much as they possibly can. He has unity and stability. Would he have the same at Ibrox? In the end, it came down to this: the only way he was leaving Aberdeen to join Rangers was by resigning and thereby torching every relationship he'd created at Pittodrie over the years. He decided that the Rangers he would be joining just weren't worth it. He appreciated what he had at Aberdeen too much to leave rancour and bitterness in his wake. When that statement was issued on Thursday evening, it begged questions about how it was allowed to be released. If the Rangers board don't concern themselves with how it was perceived by those outside of Ibrox then they might have cause for thought about how it has gone down among elements of their own support. There were few comforting words in that statement for Rangers fans. Very little for them to rally around. Had there been an acceptance that this process had been a mess and that serious lessons would be learned then that would have been something. Had there been an element of contrition and a reassurance that Plan B was about to be acted upon then there might been damage limitation. Instead, the tactic was to point the finger at McInnes, seemingly in the hope of changing the narrative away from an examination of their own failings and on to the Aberdeen manager's supposed reasons for turning them down. If playing to the gallery was their intention then it would appear it has failed. All they have done is shine even more light on the fiasco. Rangers are still looking for a manager. Forty-three days and counting.